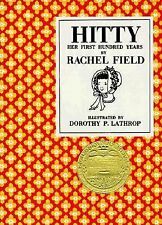 Hitty, Her First Hundred Years by Rachel Field is a book you will have to track down; I suggest starting at your local library. I've collected quotes from this book; they can be read here. Hitty is a very special doll who belongs to Phoebe. Phoebe is proud of her beautiful doll and brings Hitty everywhere she goes. This is thrilling for Hitty, who finds herself involved in the most wonderful adventures both on land and at sea. She meets many people and makes new friends. This is the story of the first hundred years of Hitty's life. And that's only the beginning for a doll as special as Hitty. This 1930 Newbery Award winner bored me senseless. Reading is rarely a chore for me - this book is a chore that I have to make myself finish. I've read this book twice now -once as a child and once as an adult- and both times, I just wanted it to end. The reoccurring thought that I had while reading - both as a child and an adult: when will something happen? I want a character who does something, anything, besides just sitting there and watching. I wasn't the type of kid who played with dolls (I love bicycles and always have) so I've never been able to identify with the character. We don't see enough of her owners for me to identify with them. The doll never does anything interesting except see. She gets battered around. I wasn't the kid who stood around gossiping with others on the playground - I'm not the adult who engages in idle fence-line chatter. And that's what this book feels like so I find it as frustrating as mindless small-talk. History has been better delivered in other books. As an adult, a few quotable lines pertaining to being battered about by the world did jump out at me, but I don't know if the reading was worth them. I'm pretty sure the ideas have been delivered elsewhere, in more interesting books, and I'd rather read them instead.